Also, if the material is a gas with no other force acting on it, why form coliminated jet? A gas would immediately disperse as a circular plume when vented in a vacuum. I was thinking something similar. The image shows what looks to be more like a pulling than pushing force, like electrons being sucked out perhaps. Also I wonder why they switched to the OSIRIS camera when nearly all other images are from the NavCam? Knowing the filter they used on OSIRIS might give us a little more of a clue too. And why the NAC when the WAC was intended more for studying gas emissions? Today's CometWatch entry, featuring a dramatic outburst from Comet 67P/Churyumov-Gerasimenko, was taken by Rosetta’s NAVCAM on 22 August 2015, about 336 km from the nucleus. How, I wonder, will the dirty snowball advocates explain such radiant brightness, large area of coverage, and wide angular span of such a, "sublimation jet?" 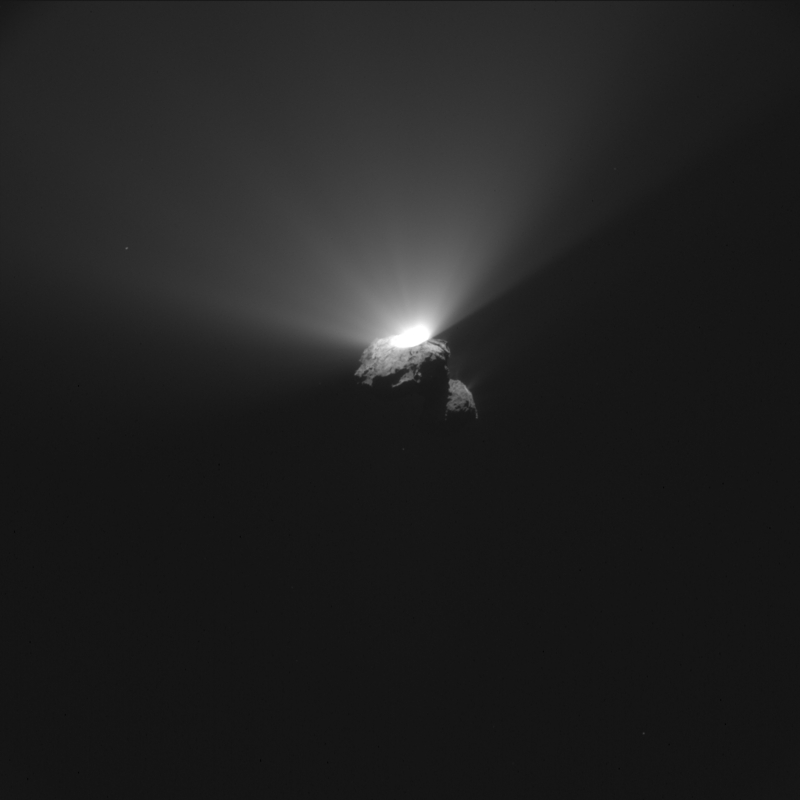 GaryN wrote: Today's CometWatch entry, featuring a dramatic outburst from Comet 67P/Churyumov-Gerasimenko, was taken by Rosetta’s NAVCAM on 22 August 2015, about 336 km from the nucleus. Yes, it should be possible for them to correlate solar flare or CME events with increased activity at the comet, but I doubt they will look into that. It seems that the Rosetta team is bound and determined to explain everything by heating and exploding gas pockets. A return to a very bight "jet", needing no enhancement, 6 days after a barely visible jet. And hysteresis is no explanation. The radiation from the Sun is more or less steady, so the heat absorbed from six days ago is the same as the heat absorbed today. No pulses of heat to be delayed by hysteresis. Interestingly today's jet is more a fan. A fan with a very bright base (reaction zone) and a more diffuse uniform progression. Very much like a flame in appearance. In fact rather than brightening the image to see the comet nucleus better it would have been far more informative to reduce the brightness to see if any detail could be resolved in the heavily overexposed bright base zone of the fan. The favoured hypothesis has all the light of the jet (fan) as reflected sunlight, from dust particles. So the dust particles remain in a clump at the base, reflecting a lot of light, then, with an abrupt demarcation, spread out into a diffuse uniform sheet, reflecting a lot less light. All done by gas pressure from within the nucleus. Much more likely that the light emitted is intrinsic, intense at the reaction zone at the nucleus surface and diffuse in the discharged plasma beyond the reaction zone demarcation. We can speculate on all this from the appearance of the image but we are very fortunate to have the Rosetta craft right there and to have the assurance that the science teams are " busy analysing the data to understand the nature of these events". So we can safely assume that they will be measuring, indeed mapping, the temperature of the jets/fans, particularly any intense bright zones. And also analysing the ion content of the jets and the ions to neutrals ratio. Hopefully they will also find it worthwhile to measure the proton current density close to the reaction zone. reasonable, these bright outbursts are likely to be plasma discharges in arc mode in which the temperature expectation would be several thousand deg Celsius. Sublimed ice as gas would on the other hand be expected to exhibit a temperature of say -70 to -150 deg Celsius. Not much chance of confusion there then. We await the results with interest. Dodeca, are you implying that the most recent outburst is attributed to an arc discharge while all previous episodes were not? I'm curious because you stated a predicted temperature of 800-1000 deg C if it's an arc discharge. However, this temperature has not been recorded thus far (in released data) so if this event was a discharge then no other event since Rosetta's arrival has been a discharge, per your statements. In that sense, you'd be agreeing that the jet behavior up to perihelion has been caused by sublimation, or at least not due to electromagnetic phenomena. No I am not.Rossim.We will wait for the data.I dont believe anything of the sublimation story.There is no ice! You don't think that ESA would have released any statement since August of 2014 if they've measured temperature spikes of 800-1000 degrees C? Remember, there is no conspiracy, only the mainstream's misinterpretation of indirectly observed processes. I'm still waiting for the big analyses of the composition of the comet body. Unless I've missed that I don't see the big subsurface ice glacier causing all the jetting. I would replace "misinterpretation" with "ignorance, stubbornness and stupidity"
money or reputation are involved. I think beyond money and reputation, perpetuation of mainstream theory is a function of the status quo's refusal to examine seriously the gaping flaws in the habitual or expected conclusions. Electro-chemical processes to create the cometary water in situ and above the dry surface cannot be seriously considered because they are on a one-track minded hunt for "subsurface everything." They're doing it for Enceladus so they're doing it for comets (although Enceledus' surface is clearly composed of ices and comets are asteroid-like--a contradiction). how the descent would have looked if viewed from Philae in real time. Some small patches were edited due to drop-outs in the original data. of water ice and is consistent with a low albedo, organics-rich surface. Almost no water. Dry as coal. Yes so why the ongoing and perpetual references to comets as primordial ice bodies "seeding Earth's oceans"?